Why Did Kayla Mueller Give Her Life to the Middle East? Originally published under the title, "Kayla Mueller and the History of Westerners Giving Their Lives to the Middle East." Kayla Mueller wrote that her "life's work" was "to go where there is suffering." For centuries, Westerners have been lured by the "mysterious" East. Fortune hunters, explorers, adventurers, businessmen, diplomats, journalists, artists, missionaries, and humanitarian aid workers have all fled the confines of the West for lives of drama and danger. The tragic Kayla Mueller wrote on her blog: "This is really my life's work, to go where there is suffering. I suppose, like us all, I'm learning how to deal with the suffering of the world inside myself…to deal with my own pain and most importantly to still have the ability to be proactive." Lawrence of Arabia and his colleague Gertrude Bell found greater personal freedom for themselves, as well as adventure, in what became Iraq and the Kingdom of Jordan. Life back home was cold, wet, and dreary; they became figures of significance and respect in sunny Middle East. Gustave Flaubert toured the brothels of Egypt. The extraordinary and much-maligned Western "Orientalist" painters (David Roberts, Ernst Koerner, Elizabet Jerichau-Baumann, Jean Discart, Charles Robertson, etc.) have lovingly preserved the 19th century Arab and Muslim world. Many of their paintings now belong to the Mohamed Shafik Gabr Foundation, where they are highly valued. The Western artists and the early 18th and 19th century female travelers (Lady Hester Stanhope, Lady Wortley Montagu, Isabel Burton, Jane Digby El Mezrab, Harriet Martineau, Isabelle Eberhardt, etc.) had no desire to change the East; while they may have been corseted, they were not shut up in harems, and they relished the lush and exotic life travel afford them. What leads Westerners to believe that they can travel safely in Muslim war zones? But some Westerners have wanted to "uplift the natives," either by converting them to Christianity or by ministering to their medical and educational needs. Like Kayla Mueller, many Americans have felt both obligated and entitled to help others—an ideal many hold dear. The question is: Why travel to Iranian backed Assad- and ISIS-controlled Syria now? Yes, the plight of the persecuted Christians and Kurds and Yazidis, especially in Iraq, cries out for rescue, as does that of all civilian refugees in the region. The White House has a lot to be guilty about regarding its military strategy—but why would young and tender civilians think that their becoming ministering angels can really make enough of difference? What is it that led journalist Daniel Pearl (2002), businessman Nicholas Berg (2004), aid worker Gayle Williams (2008), aid worker David Haines (2014), aid worker Alan Henning (2014), journalist James Foley (2014), aid worker Peter Kassig, (2014), journalist Steven Sotloff (2014), businessman Haruna Yukawa (2015), journalist Kenji Goto (2015), and aid worker Kayla Mueller (2015) to believe that they could travel safely in Muslim war zones—especially today? Rudyard Kipling, in The Man Who Would Be King, describes what happened to his two fictional characters who traveled to Afghanistan in search of treasure. One was crucified, the other driven mad. These things happen there to anyone without the proper letters of introduction and entourage. Routinely, if they are lucky, foreigners merely contract malaria, dysentery, hepatitis, and other life-long ailments; otherwise, they are held for ransom, shut up in a polygamous harem, tortured, and beheaded. 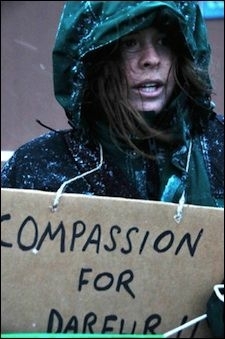 Kayla Mueller headed a Darfur awareness group during her student days at Northern Arizona University. 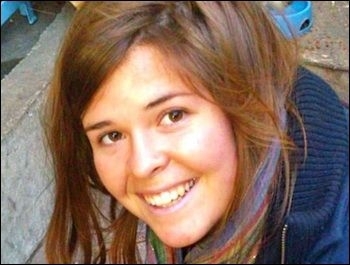 Kayla Mueller supported the International Solidarity Movement (ISM), which immediately sought to capitalize on her murder by canonizing her politically. To some, such politics is viewed as a form of righteous resistance. It is not viewed as a politically correct conformist position, which it certainly is– or, in the worst cases, as an example of a Westerner making common cause with totalitarian Islamism, anti-Americanism, and genocidal anti-Semitism. My colleague Joel Pollak wrote a sane, sad, soulful and rather mild piece about Mueller. He wondered whether she could have been "misled, tragically, about Islamic 'resistance.'" He inherited a bit of a backlash. Those who share Mueller's beliefs and/or who view her death as somehow sacred were offended. Their anger is misplaced. It should be focused on the barbarians who held Mueller captive and then murdered her—not on a journalist who has every right to raise any question under the sun. This scenario also evokes memories of the death of American Rachel Corrie, also at the hands of the ISM movement, which exploited her naivete and then used her accidental death as propaganda fodder. The ISM accused an Israeli military bulldozer driver—who could not even see her—of killing her on purpose. Corrie also became a sacred victim and the reason for countless columns, demonstrations, a "wrongful death" lawsuit (which her family lost), and a one-sided propaganda play. May Kayla Mueller rest in peace. May her family know comfort and solace. May the families of all the Western aid workers and journalists find some peace. May Western civilians stay out of the line of fire for now. May the West finally name radical Islam, Islamism, Islamic terrorism, Islamic totalitarianism as the enemy we are fighting—and then proceed to vanquish both its ideas and soldiers and thus, bring peace and stability to a world in chaos and misery.